If you are wondering how to buy soft shell crabs, it's easier than you think. There are just a few specifics you need to know before you run right out and pick up the first soft shell crab you see or order from the first website you visit. Check out some of the basics of buying soft shell crabs and the advice you should take when viewing potential dinner. The blue crab is the only one you can really get from stores and seafood retailers. From infant to adult, blue crabs take 12-18 months. This pretty quick. During one stage of growth, the blue crab will lose its shell. To do this, the blue crab will grow by 30 percent. Commercial fishers will gather the crabs right before their shed date and keep them in tanks. There are three lines on the rear fine the crabbers look for. A pink line means the crab will shed its shell anywhere from two to seven days. A red line means the shell could be shed at anytime. Mediums: 3.5-4 inches and average 1.8 oz in weight. Whales: 5.5 inches and above and average 5.9 oz in weight. When they are boxed up and shipped, they are alive, but if they die in transit they can still be fresh. How is this so? The crab meat will have a distinctive smell. If there is a powerful ammonia smell, do no cook or serve that crab. If there is no odor, then that crab is still considered fresh and can still be eaten. On average, there is a shelf life of two to five days, but in the end, rely on the smell to determine if you can serve it. Most of your blue crabs will come from three places: the Carolinas, Maryland, and Louisiana. Maryland crabs have a tendency to be high in fat and very tasty because of the area's cold water; they're also a little more expensive. Behind Maryland are North and South Carolina's crabs, which aren't as expensive but are still a very good delicacy. If you are on a budget and would like more crab for your buck, try to find blue crab from Louisiana's waters. Once you've figured out how to buy soft shell crabs, you need to store them properly. Keep the crab in moist packaging. Moisture is what keeps the crab meat fresh and flavorful. Use wet newspaper or even straw to trap the moisture. If you plan on keeping the crab live, then you will need to keep it in an approximately 50-degree temperature fridge. If you just want to keep it fresh, then 36 degrees is what you need. Note: If you store a live product in the 36-degree container, it will die and turn fresh. It's still edible, so don't worry. If you aren't sure about the crabs you are purchasing there are a couple of questions you can ask because most seafood retailers get their crabs from one place. How are the crabs transported? Were they shipped live or fresh? How long have these crabs been here? Ask to smell the crab before they package it. Check the crab to see if any of their claws are missing. 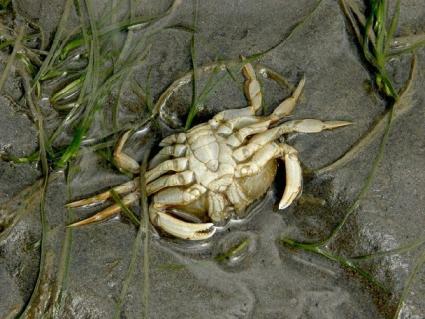 When attacked, the crabs have the ability to lose a limb. When figuring out how to buy soft shell crabs and you don't notice, you might get a substandard crab because too many crabs are piled on each other. You want to have the best crabs for your money so don't settle for a crab with one claw and two legs!